Typewritten Letter Signed, one page, octavo, May 12, 1939. 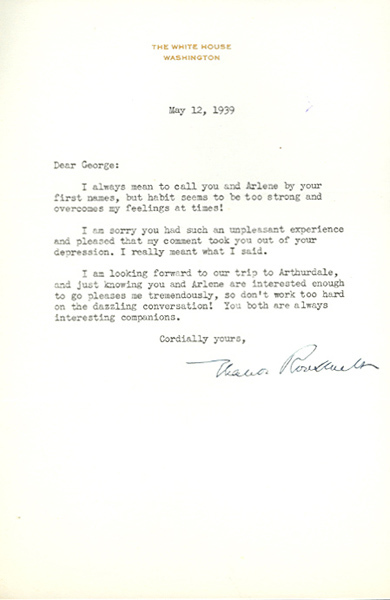 On White House stationery, to her literary agent George Bye. “I always mean to call you and Arlene by your first names, but habit seems to be too strong and overcomes my feelings! “I am sorry you had such an unpleasant experience and pleased that my comment took you out of your depression. I really meant what I said. Arthurdale was the site of an important social-engineering project initiated by Eleanor Roosevelt in the mid-1930s in West Virginia. Designed to improve the lives of coal miners and their families who were suffering from the Great Depression, the planned community included farms, homes, schools, shops, and medical facilities. The government bought the land with the understanding that the residents would homestead it and repay the loan after achieving a successful community. The community and others like it were to be models for eliminating poverty. 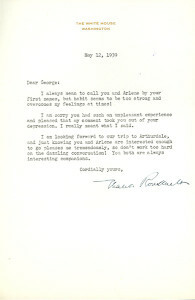 During her numerous visits to the community, Eleanor Roosevelt made a lasting impression on the people she touched.